Built for the 1904 World's Fair, the Jefferson Hotel at 12th and Locust had 800 rooms. In 1925, federal officials meeting here designated the highway between Chicago & LA as US 60. But the governor of Kentucky wanted the important sounding 60 to go through his state. Missouri & Oklahoma officials later agreed to 66. 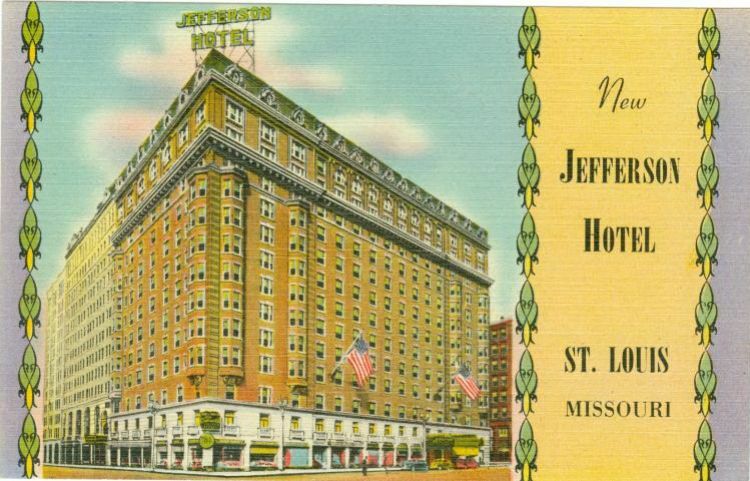 The Jefferson was later a Hilton and a Sheraton Hotel. The last guest checked out on July 23, 1975, and it later became a retirement community which has since closed. The historic Jefferson is awaiting development.